Use this ground turkey substitute in your favorite recipes, or, shape into patties to make delicious �turkey� burgers! This soy-based meat substitute is low in sodium (only 5mg per serving!) and high in potassium, making it much more heart-healthy than some other vegan meat alternatives on the market. Versatile and tasty, this 1 lb. bag will create the equivalent of 3.92 lbs. 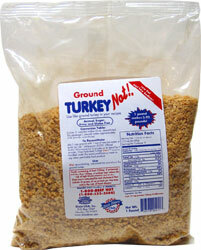 of ground �turkey� when reconstituted, making it an exceptional deal for your dollar! Gluten-Free. 1 lb. bag is $6.99. "Cheerful Log" Vegan Ham Loaf by Loving Hut -- Please read important shipping information below before ordering to ensure items arrive in optimal condition, items not shipped as per instructions below are sent at your own risk! The Cheerful Spring log is exceptional . . .
Artichoke Burgers by Five Star Foodies -- IMPORTANT SHIPPING INFORMATION FOR THIS ITEM � PLEASE READ BELOW! These burgers are in a class of their own, unlike any other vegan burger you�ve tried! Filled with the rich taste of artichoke hearts and cashews combined . . .
Bacon Style Seitan Strips by Upton's Naturals -- IMPORTANT SHIPPING INFORMATION FOR THIS ITEM � PLEASE READ BELOW! Upton�s Naturals Bacon-Style Seitan is not only delicious and completely unique, it�s also a healthy and cruelty-free alternative to meat that�s 100% vegan . . . Beyond Meat Chicken-Free Strips -- Please read important shipping information below before ordering. Thank you!They're finally here! The long-awaited new meat alternative that's going to change the way the world thinks about plant-based protein, Beyond . . . Breaded Vegan Fishless Sticks by Sophie's Kitchen -- Nutrition Facts Serving Size 2 pieces (65g / 2.3 oz.) Servings Per Container 4 Amount Per Serving Calories 140 Total Fat 6g Trans Fat 0g . . .
Butler Soy Curls -- An interesting new meat substitute, Soy Curls make an excellent addition to soups, casseroles, potatoes, rice, stir-fries, noodles, spaghetti sauce, chili, pizza toppings, salads, curries, enchiladas and more. With 10g of . . .
Cavi-Art Vegan Caviar Alternative -- Cavi-art is a unique vegan alternative to caviar that's made from seaweed - it looks and tastes like the real thing, but of course, it's 100% fish-friendly! The caviar-like "pop" consistency and amazing flavor . . .
Chorizo Style Tofurky Crumbles by Turtle Island Foods -- Please read important shipping information below before ordering to ensure items arrive in optimal condition, items not shipped as per instructions below are sent at your own risk! Spice up those boring tacos with these . . .
Classic-Style Vegan Buffalo Wings by Gardein -- Please read important shipping information below before ordering to ensure items arrive in optimal condition, items not shipped as per instructions below are sent at your own risk! Spice up your mealtime with these hot wings . . .
Crispy Chick'n Sliders by Gardein -- Please read important shipping information below before ordering to ensure items arrive in optimal condition, items not shipped as per instructions below are sent at your own risk! In the mood for something small and hearty . . .
Field Roast Apple Maple Breakfast Sausages -- Please read important shipping information below before ordering to ensure items arrive in optimal condition, items not shipped as per instructions below are sent at your own risk! Our mornings are defined by the nourishing . . .
Field Roast Classic Vegan Meatloaf -- Please read important shipping information below before ordering to ensure items arrive in optimal condition, items not shipped as per instructions below are sent at your own risk!This delicious, savory meatloaf is pure vegan . . .
Field Roast Deli Slices -- Please read important shipping information below before ordering to ensure items arrive in optimal condition, items not shipped as per instructions below are sent at your own risk! Pre-sliced and ready to eat from the package . . .
Field Roast Stuffed Celebration Roast -- Please read important shipping information below before ordering to ensure items arrive in optimal condition, items not shipped as per instructions below are sent at your own risk! Even if it�s not the holidays, there�s always . . .
Field Roast Vegan Frankfurters -- Please read important shipping information below before ordering to ensure items arrive in optimal condition, items not shipped as per instructions below are sent at your own risk! Field Roast Vegan Frankfurters are a great . . .
Field Roast Vegan Sausages -- Please read important shipping information below before ordering to ensure items arrive in optimal condition, items not shipped as per instructions below are sent at your own risk! Made in small batches using traditional . . .
Fishless Vegan Tuna by Meatless Select -- It has been a decade since the last canned vegan tuna alternative was available, and we're happy to announce that Meatless Select has created an amazing product that's perfect for your favorite recipes! All-natural and made . . .
Gardein Chipotle Lime Crispy Vegan Chicken Fingers -- Please read important shipping information below before ordering to ensure items arrive in optimal condition, items not shipped as per instructions below are sent at your own risk! Make a delicious main course, put . . .
Gardein Sweet and Tangy Meatless Barbecue Wings -- Please read important shipping information below before ordering to ensure items arrive in optimal condition, items not shipped as per instructions below are sent at your own risk! If you like your vegan wings with flavor . . .
Gardein Teriyaki Chick'n Strips -- Please read important shipping information below before ordering to ensure items arrive in optimal condition, items not shipped as per instructions below are sent at your own risk! Gardein is back with a new way for you to . . .
Gran Chorizo Vegan Salami by Wheaty -- This vegan delicacy brings Spanish flair to the world of vegan meat alternatives! It�s a solid, savory, full-bodied wheat-based sausage that�s air-dried to perfection as is done in traditional sausage making. High in protein . . .
Grilled Soy Chicken Cutlet with Garlic Lemon Herb Sauce by Veggie Brothers -- Please read important shipping information below before ordering to ensure items arrive in optimal condition, items not shipped as per instructions below are sent at your own risk! Get your vegan �chicken� fix with these . . .
Grilled Vegan Mahi Mahi Steak by Veggie Brothers -- Please read important shipping information below before ordering to ensure items arrive in optimal condition, items not shipped as per instructions below are sent at your own risk! Get your cruelty-free catch of the day with . . . Ground Beef(Not) Bits by Dixie Diner -- A quick, easy and tasty replacement for ground beef, use these ground vegan bits from Dixie Diner in your favorite recipes in place of real meat to create whatever your heart desires. These bits reconstitute quickly in water . . . Ham(Not!) Mix by Dixie Diner -- If you�ve been searching for that ideal mock meat that�s got a ham-style flavor, then this is for you. Each bag of soy based Ham(Not!) makes a whopping 2 � lbs. of reconstituted minced �ham� that�s absolutely delicious! Try . . .
Hilary's Eat Well Burgers -- Please read important shipping information below before ordering to ensure items arrive in optimal condition, items not shipped as per instructions below are sent at your own risk! Quick and easy to prepare, Hilary's Eat . . .
Hilary's Eat Well Original Veggie Bites -- Please read important shipping information below before ordering to ensure items arrive in optimal condition, items not shipped as per instructions below are sent at your own risk! From freezer to table in minutes, these . . .
Home-Style Beefless Tips by Gardein -- Please read important shipping information below before ordering to ensure items arrive in optimal condition, items not shipped as per instructions below are sent at your own risk! These tasty and tender �beef� tips add a . . . Hot & Spicy Soy Chicken Buffalo Wings by Veggie Brothers -- Please read important shipping information below before ordering to ensure items arrive in optimal condition, items not shipped as per instructions below are sent at your own risk! These tasty vegan buffalo wings are smothered . . . Instant Veggie Burger Mixes from Great Life by Lucinda -- Whereas some veggie burgers out there are made with low-grade ingredients, some of which are hard to pronounce and most certainly aren't natural, Great Life by Lucinda's Instant Veggie Burgers are the real deal! Made only . . .
J&D�s Bacon Salt -- This unique seasoning salt has a delicious smoky �bacon� flavor that will spice up your soups, vegetables, main courses, and even snacks like popcorn, too! Put a sprinkle on your baked potato, flavor your stewed greens (it . . .
Jumbo Franks by Cedar Lake -- Get ready for some seriously big franks from Cedar Lake! These delicious vegan deli-style franks are ready to heat and serve and make for a quick protein-packed meal that the whole family will love. Available in a 20 oz. . . .
Lightly Breaded Turk'y Cutlets with Homestyle Gravy by Gardein -- Please read important shipping information below before ordering to ensure items arrive in optimal condition, items not shipped as per instructions below are sent at your own risk! It doesn�t have to be Thanksgiving to enjoy . . .
Little Links by Loma Linda -- An excellent breakfast �sausage�, just brown and serve these links for a tasty morning meat substitute that you�re sure to enjoy. Kosher. 19 oz. can is $6.99. Ingredients: Water, wheat gluten, corn oil, defatted wheat germ . . .
Mandarin Orange Crispy Chick'n Strips by Gardein -- Please read important shipping information below before ordering to ensure items arrive in optimal condition, items not shipped as per instructions below are sent at your own risk! It�s better than take-out! Ready in only . . . Match Meat Vegan Meat Alternatives -- Please read important shipping information below before ordering to ensure items arrive in optimal condition, items not shipped as per instructions below are sent at your own risk! Match Meat vegan meat alternatives are the . . .
Nate's Meatless Meatballs -- Please read important shipping information below before ordering to ensure items arrive in optimal condition, items not shipped as per instructions below are sent at your own risk! With Nate�s Meatless Meatballs, you no longer . . .
Neat - A Healthy Replacement For Meat by Neat Foods -- Neat is an easy-to-make, great tasting replacement for ground beef. It�s derived from nuts and other natural ingredients, and prepares with just water and your preferred egg replacer. Even the most choosy meat . . . Ocean Loaf Vegan Fish Alternative by Loving Hut -- Please read important shipping information below before ordering to ensure items arrive in optimal condition, items not shipped as per instructions below are sent at your own risk!If you long for a vegan fish alternative . . . Ocean Log Vegan Fish Alternative by Loving Hut -- Please read important shipping information below before ordering to ensure items arrive in optimal condition, items not shipped as per instructions below are sent at your own risk!If you long for a vegan fish alternative . . . Ocean's Best Vegan Shrimp by ecoVegan -- Please read important shipping information below before ordering to ensure items arrive in optimal condition, items not shipped as per instructions below are sent at your own risk!These delicious and versatile vegan shrimp . . . Ocean's Delight Vegan "Fish" Patties by ecoVegan -- Please read important shipping information below before ordering to ensure items arrive in optimal condition, items not shipped as per instructions below are sent at your own risk! These seasoned patties are similar . . .
Organic Bac'uns Bacon Bits Alternative -- A great tasting vegan alternative to bacon bits, Bac�uns offer the same flavor but without the meat, cholesterol, artificial colors and preservatives. Use them to top salads, spruce up a baked potato, or top off your favorite . . .
Organic Chickin Fillets by Viana -- Please see shipping information below. Thank you!These crispy fillets can be pan fried, deep fried or baked to come out tender and juicy. Excellent by themselves, on a bun for a �chicken� sandwich, or cut into strips . . .
Organic Chickin Nuggets by Viana -- Please see shipping information below. Thank you!These crispy (and tasty!) mock chicken nuggets are delicious any way you serve them � whether it's pan fried, deep fried, stir fried or baked! Serve with your favorite . . .
Organic Cowgirl Veggie Steaks by Viana -- Please see shipping information below. Thank you!Juicy and flavorful, these vegan �steaks� can easily be grilled to perfection and are the perfect hearty main course to a down-home vegan dinner. Certified organic and . . .
Organic Mediterranean Sausages (Cevapcici Style) by Viana -- Please see shipping information below. Thank you!These spicy Yugoslavian-style veggie sausages are delicious when fried up crispy and brown, and make an excellent main course or can be used as a meat substitute in your . . .
Organic Textured Soy Protein Granules by NOW Natural Foods -- A versatile food product derived from defatted steamed soybeans, these TSP (also called TVP) granules are a fantastic quick meat substitute for a multitude of meals. Great in stews, casseroles, soups, pastas, for making . . .
Organic Textured Soy Protein Nuggets by NOW Natural Foods -- A versatile food product derived from defatted steamed soybeans, these textured soy protein (also called TVP) chunks are a fantastic quick meat substitute for a multitude of meals. Stews, casseroles, soups, pastas�wherever . . .
Organic Vegan Bratwurst by Viana -- Please read important shipping information below before ordering. Thank you! Nobody does true vegan bratwurst like Viana � these deliciously seasoned vegan sausages have an excellent taste and texture much like authentic . . .